Note: This section is for submission of abstracts for oral and poster presentations. Ethicon Prize submissions please click here. The Scientific Committee welcomes the submission of free communications. This could be in the form of Oral or Poster Presentations. Abstracts submission is to be done online via this page. Full submission instructions as well as guidelines are in the subsequent sections below. You are kindly invited to submit scientific contributions to be presented during the meeting. As an alternative to the traditional printed paper poster, the CSAMM is pleased to introduce e-posters to the Annual Scientific Congress 2019. E-posters will replace the printed posters and we are sure that you will share our enthusiasm for this innovative approach to poster presentation. As you will have uploaded your poster in advance there is no need to print and carry a poster to the meeting. This will save you the time and costs associated with printing and reduce the carbon footprint of the meeting. There will be monitors at the conference where all posters can be viewed. Successful entrants will be emailed instructions on how to upload their e-posters for presentation after 31st March 2019. Your e-poster should be produced using the PowerPoint Poster template which will be provided. The content of the presentation should be of a single slide. E-Posters of different dimensions may be skewed/stretched/truncated when displayed on the monitors at the Annual Scientific Congress unless they conform to the template. A maximum of ten E-posters adjudged to be of sufficient merit will be eligible for the top three prizes. In the event that none of the submissions achieves sufficient academic merit, no prizes will be awarded. Abstracts must be accompanied by payment of registration fees. 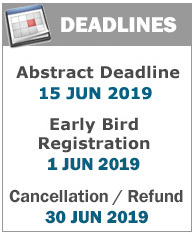 If the abstract is subsequently not accept for presentation, and the author wishes to cancel his participation, the registration fee will be refunded to the author. Abstracts must not be more than 300 words (inclusive of title and author(s) name). Author(s) name(s) and institution(s). Do not include degrees or professional titiles. A maximum of four (4) authors can be listed. 1 YOU MUST REGISTER FOR THE CONFERENCE. UPON SUCCESSFUL REGISTRATION, YOU WILL OBTAIN YOUR CUSTOMER ID. IF YOU HAVE NOT ALREADY DONE SO, REGISTER HERE. 2 YOU MUST USE THE ABSTRACT TEMPLATE PROVIDED. BY USING YOUR CUSTOMER ID.